On the evening of April 4, 2018, organized by the Student Union of the School of Design, CAFA, the “Design 28 Days” event invited Zhou Bo, Associate Professor from the School of Design, CAFA, to give a lecture on “Dunhuang and Modern Visual Culture in China” which was the 4th one in the series, at the Red Chair Lecture Hall, Building 7, CAFA. 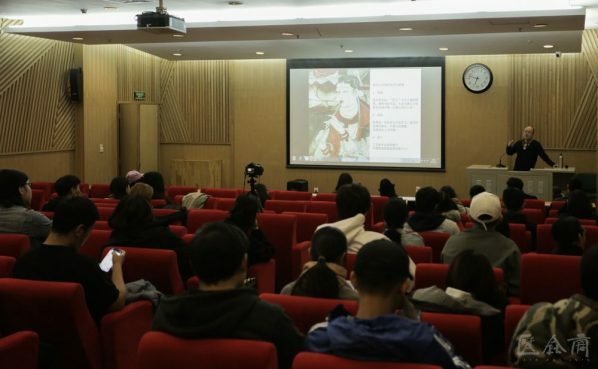 In this lecture, the artworks by Zhang Daqian, Wu Zuoren, Sun Zongwei, Dong Xiwen, Saone Chang and so on were used to introduce Dunhuang’s influence on modern Chinese art and design. It shows that the characteristics and charm of Dunhuang art has influenced and inspired modern Chinese artists who were faced with a dilemma of intelligence in making a breakthrough in their art. Dunhuang art revealed the spirit of Chinese civilization as possessed by young people which was vigor and vitality. As a repository of artistic treasures and the convergence of Eastern & Western art from the Han Dynasty to Tang Dynasty, Dunhuang that was of a compatible and inclusive spirit that collectively showcased the charm of the art of Han and Tang dynasties. Dunhuang was a treasure trove of early Buddhist art. It is also an embodiment of spiritual resonance and represents the creative peak of figure paintings. There are many large-scale mural figures, complicated compositions and associations with a variety of lines, shapes and colors of the latter literati paintings. In the early 20th century, Chinese modern art faced a plight of intelligence in the field of Chinese painting, oil painting and design. Chinese modern art proposed an art revolution in the field of Chinese painting, and Kang Youwei proposed realistic, professional and retro ideas, while Dunhuang offered important visual resources, so that the artists could see the true artistic features of the Tang dynasty and before the Tang dynasty; as a foreign product, modern oil painting faced the problems of retaining a national identity and incorporating a sense of the local and artists were looking for a breakthrough in language; design was regarded as a pattern of study at that time, it was necessary to study Chinese traditional patterns and search for the design rules for Chinese patterns, while it also sought the spirit & courage of Chinese plastic arts for the public art of New China. In the 20th century, modern China was faced with the spiritual appeal of a “powerful country” and “rejuvenation”, and artists were in need of a blueprint and model, namely Dunhuang art. From the 1940s to the 1950s, many artists went to Dunhuang to copy the murals. 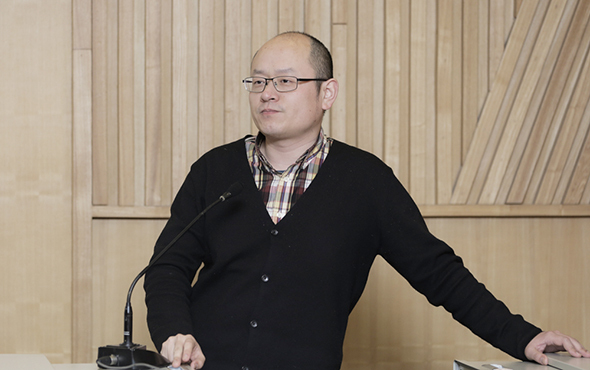 Zhou Bo said that it was an individual-oriented reproduction in the 1940s, and it was dominated by reproduction that echoed the situation after 1945. He called the ways of reproduction used by Zhang Daqian, Chang Shuhong, Wu Zuoren and Guan Shanyue as recovery reproduction, situational reproduction, sketching reproduction, and impressionistic reproduction. He then used many works created by Zhang Daqian, Wu Zuoren, Chang Shuhong, Guan Shanyue, Sun Zongwei, Dong Xiwen and Saone Chang, to introduce how Dunhuang influenced these artists. Zhang Daqian had copied a total of 276 mural paintings of a variety of dynasties. Dunhuang murals greatly impacted on Zhang Daqian’s use of writing, colour and the disposition of paintings. For example, the popular “fragile” women images were replaced by “healthy & beautiful” forms, neutralizing the Tang style and Tang Yin’s style. Zhang Daqian’s activities in reproduction also caused damage to the Dunhuang murals. During the copying of the murals, many pieces were peeled off and irreversibly damaged. Fan Zhenxu and Xie Zhiliu together with Zhang Daqian went to Dunhuang to inspect and copy murals. In 1941, recommended by Lyu Sibai, Director of the Art Department of Central University at that time, Sun Zongwei became Zhang Daqian’s assistant in visiting Dunhuang. In the 1940s, Pan Xiezi studied and copied the murals of the Dunhuang Grottoes, and he created the excellent work “The Creators of Cave Art”. Saone Chang had copied murals together with her father Chang Shuhong since her childhood with Dunhuang murals always being her inspiration for art creation. Many Dunhuang paintings created by her father Chang Shuhong remain and were deeply influenced by the Dunhuang painting style. In 1958, Beijing’s ten giant buildings were formally launched. Saone Chang, as a young teacher, participated in the architectural decoration design of the “Top Ten Buildings” of the capital and participated in the design of the ceiling of the Banquet Hall of the Great Hall of the People. Referring to lotus patterns of the caissons of Cave 31 at Dunhuang Grottoes of the glorious age of the Tang Dynasty, Saone Chang had repeatedly revised and improved the style for the creation of design patterns. Saone Chang also combined Dunhuang patterns and colors with the design of the “Golden Hall” of the Great Hall of the People, as well as the xumizuo of the pillars outside the Hall, the inside and outside lintels, lighting, and window grilles. When the 29-year-old artist Dong Xiwen visited the “Dunhuang Art and Northwest Customs Sketching Exhibition” organized by the Central Library in 1943, he was greatly impressed. He contacted Chang Shuhong from the National Institute of Dunhuang Art and expressed his desire to visit the Mogao Grottoes. He particularly loved copying the large-scale murals with complicated plots and large scenes, and his use of color, space and techniques in his paintings were greatly affected by Dunhuang art. Zhou Bo came to the conclusion that Dunhuang played a role in Chinese modern visual culture that it was a treasure trove of visual art resources. Studying at Dunhuang, we can connect Han and Tang spirit with Chinese modern art and social spirit. For artists, it is necessary to personally discover tradition, using it as our own accumulation of art and the need to find the current entry.